This is definitely a delightful disc for the hot and sultry summer months. Hartmann is the principal oboe for the Berlin Philharmonic Orchestra and his accompanists also hail from this great orchestra so pure virtuosity and wonderful making is virtually guaranteed. 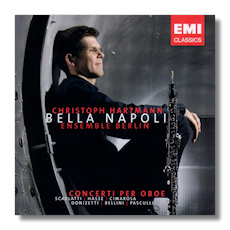 The composers on disc all hailed or worked in Naples and the lovely concertos by Domenico Scarlatti bring out a succinctly clear and effusive sound from Hartmann and his Berliners. The same goes for the Bellini and Donizetti works, both closer to the operatic world than the symphonic but charming nonetheless. I also greatly enjoyed the Pasculli work in its rather delightful arrangement by Renz which also brings out the wonderful qualities of Hartmann's oboe playing. EMI's recording is as clear as crystal as is to be expected and the notes are detailed but at the same time concise. Although on the shorter side at 53 minutes, this CD will bring many a smile to those who put it into their player as the mercury continues to rise.